Egyptian witchcraft isn't the most common combination but many people who follow a magickal path will be drawn to the pantheon of Egypt in their studies. A lot of spells and rituals in Egyptian witchcraft centered on the afterlife, and ensuring the safety and success of the soul after death. The well-known Egyptian Book of the Dead is filled with such spells. Healing magick was also common, and it was just as important as more scientific medical practices. Magick performed during the time of ancient Egypt was usually performed by priests or magicians, and it wasn't something that people would have done for themselves as part of a spiritual or cultural practice. Today, many people who practice "Egyptian witchcraft" are really following a variation of Wicca that includes the involvement of Egyptian Deities. In other words, its not the same type of practice that ancient Egyptians would have followed. 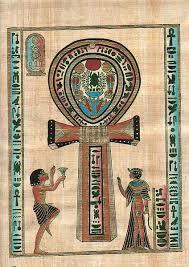 Circles, altars, spells are all Wiccan-based but using terminology and Egyptian Gods and Goddesses. The actual spiritual path from Egypt is called Kemeticism which is a closer idea to true Egyptian witchcraft and religion. Though we are generally familiar with this pantheon of Egyptian Deities, the reality is that they are all considered aspects or facets of the larger spirit known as Netjer.